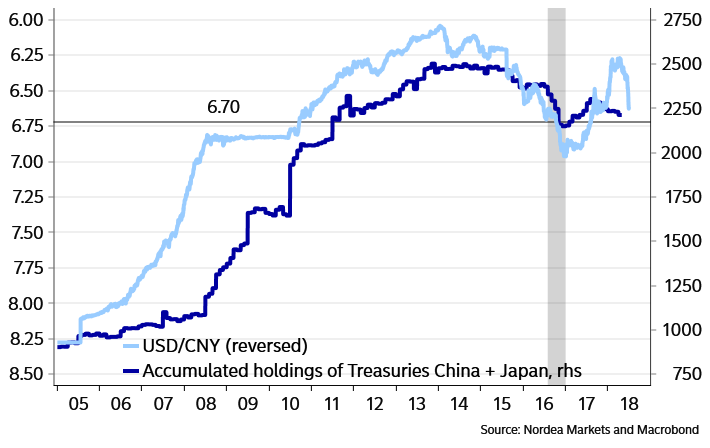 The CNY Conundrum - Has The PBOC Deliberately Weakened Yuan As Part Of The Trade War? HAS THE PBOC DELIBERATELY WEAKENED CNY AS PART OF THE TRADE WAR? It has been another trade war week, as the market has been looking for clues on the Chinese retaliation measures against the Trump tariffs that are planned to go live on 6 July. Last week we wrote that we found trade-based Chinese retaliation measures more likely than attempts to retaliate via the financial markets. The fact that Trump is threatening with new tariffs on goods worth a total of USD 450bn makes the retaliation process trickier for China. It is simply not possible to retaliate symmetrically, as there are not enough US exports into China to tax. This leaves an elevated risk of unorthodox retaliation measures being used. Prohibiting symbolic US products from entering Chinese territory could be one way of doing it. Expect more clarity on whether Xi Jinping will deliver an ALL-IN answer as early as this weekend. Earlier in the week, stories emerged that the PBoC had been told by Xi’s administration to stop buying or even off-load Treasuries. While it is hard to prove whether that was actually the case this week, there are signs that especially the Chinese market is discounting a marked escalation of the conflict. The Shanghai Composite is down almost 23% since its peak in January. The general risk off and lack of faith could be the reason for the weakening CNY. We wrote earlier this year that 10yr bond yields in China and US rarely move out of tandem for prolonged periods (not observed since 2008), but this time around it could be that markets are sending a signal that US growth momentum holds up much better than Chinese growth trends. Just this week the PBoC cut its reserve requirements in the attempt to add some needed stimuli to the Chinese momentum. This is another sign that US economic performance and market variables look substantially more resilient to the trade war than in the Euro area and China, which Trump is currently targeting. This is sadly something that will likely increase Trump’s appetite of continuing down the current path and also a sign that Trump has the upper hand on both China and Europe currently. No matter whether or not the PBoC has been a part of weakening the CNY (some Chinese sources indicate that the PBoC has helped the weakening trend), the current market situation may not be too bad for China, as a market-based upside pressure on USD/CNY allows China to 1) sell USD, 2) sell Treasuries and 3) ride the impulse from a slightly weaker currency. 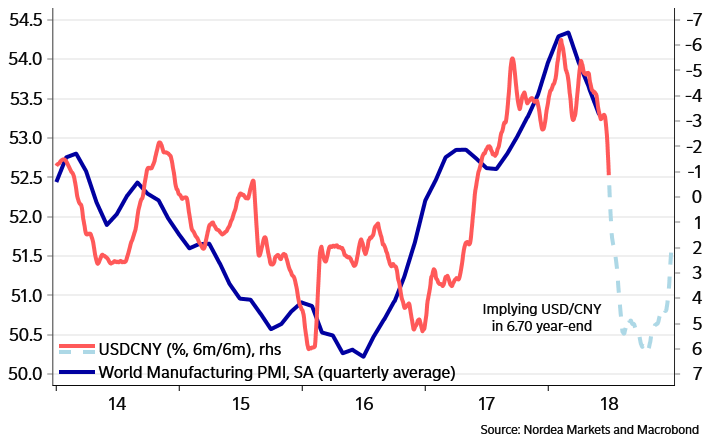 Should USD/CNY at 6.70 be seen as an issue for global growth in general? It could be if it is a sign of broader tightening of financial conditions in EM due to outflows or EM central banks combatting these outflows. CHART 4: WEAKER CNY, STRONGER USD. 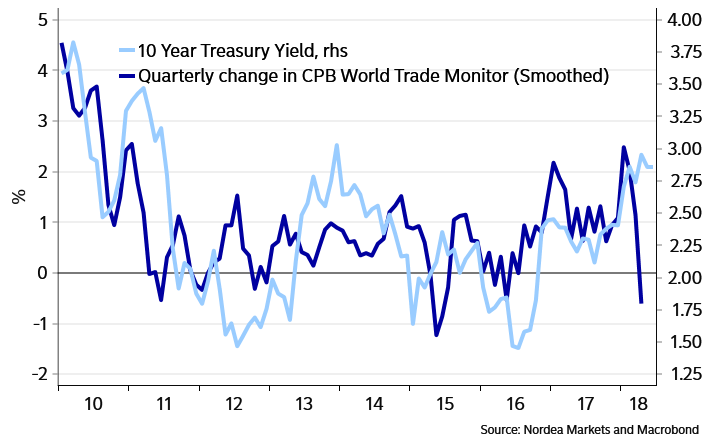 A GENERAL PROBLEM FOR PMI MOMENTUM? 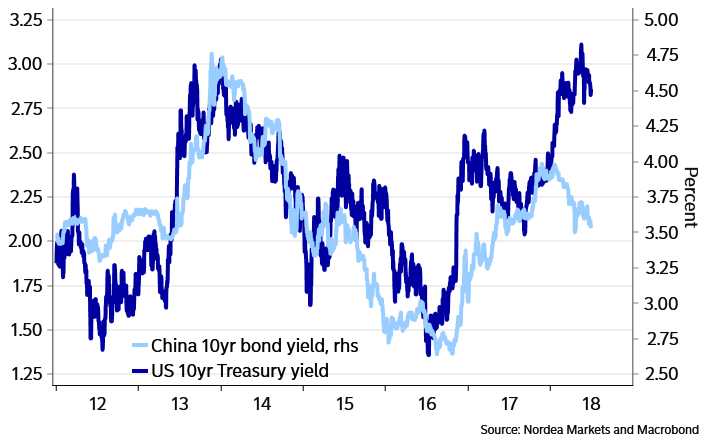 And as a side-effect, the weakness of the CNY has added to the downside pressure on other Asian EM currencies, as the capital flows continue to leave Emerging Markets broadly. The Indian central bank, which pleaded with the Fed for help a few weeks back, has been forced to support inventions in the rupee. Read the full report as pdf here. Read Nordea's financial forecast here.